Is It Good? 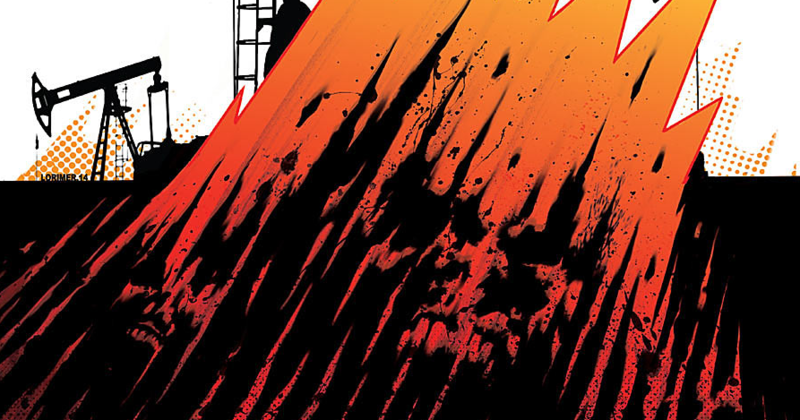 Burning Fields #1 Review – AiPT! From the creative minds of Michael Moreci (Roche Limit) and Tim Daniel (Curse, Skinned) comes the political-thriller Burning Fields. With the incorporation of international tension and a potential for fantastical elements, Burning Fields documents the investigation into a string of murders surrounding an American drill site in the Middle East. This high-anxiety series examines modern takes on our current geo-political situation overseas while blending it with an investigative drama. So is it good? What makes Burning Fields so intriguing is that it pulls you in on the very first page. The story opens with a torture scene and from that point on you’re invested. This debut issue introduces each character in a very natural series of events rather than simply typing up short bios and plastering it on a panel. While this story formatting does lead to some early confusion, it does make for a better read overall and I applaud the approach to make the introduction just mysterious enough without completely losing the audience. So what is this series about? Well the main character, Dana Atkinson, is an ex-Army investigator who is begrudgingly called back to duty to solve some murders occurring near a drill site. But what convinces Dana to get back in the game? The potential to finally bust the man responsible for ending her career in the first place (I have to admit, I wrote that paragraph with a smirk on my face because the premise does sound a little cliché, but it’s done really well). Opposite Dana is member of the Iraqi police force, Detective Aban Fasad, who is also pulled to Kirkuk to investigate these murders. While coming from separate worlds, these two investigators realize that they not only have common goals, but common enemies as well. While it’s the realism of the issue that draws you in, it’s the mythical aspects that make you stay. When I say there have been murders, I’m sugarcoating it. These people have been mutilated and it isn’t confirmed whether the culprit is even human. While there’s nothing to indicate anything supernatural from the first issue, Burning Fields‘ bio describes a potential “mythic evil that has been released” within the drilling site. It’s this component of the series that draws parallels between it and other stories such as The Thing or Scott Snyder’s recent series The Wake (and potentially other ominous and vaguely titled series). Burning Fields‘s debut provides a very strong opening to a series with a lot of potential. Moreci and Daniel have put together a very well structured issue that immediately captures your interest and eliminates any dull introductory monologues. The story blends a classic horror plot with a modern setting and appeals to any fan of political, detective, or horror genres. I can’t say enough about Lorimer who does an excellent job illustrating and capturing the tension of each situation the characters are thrust into. His artistic style fits really well with the nature of the comic and the panel-placement itself is really impressive. This is definitely a series to add to your list.